Click here to return to the 2010 Death Valley Trip index page. Woke up this morning to sun, warm temperatures and best of all, no wind (Although this was fated not to last)! 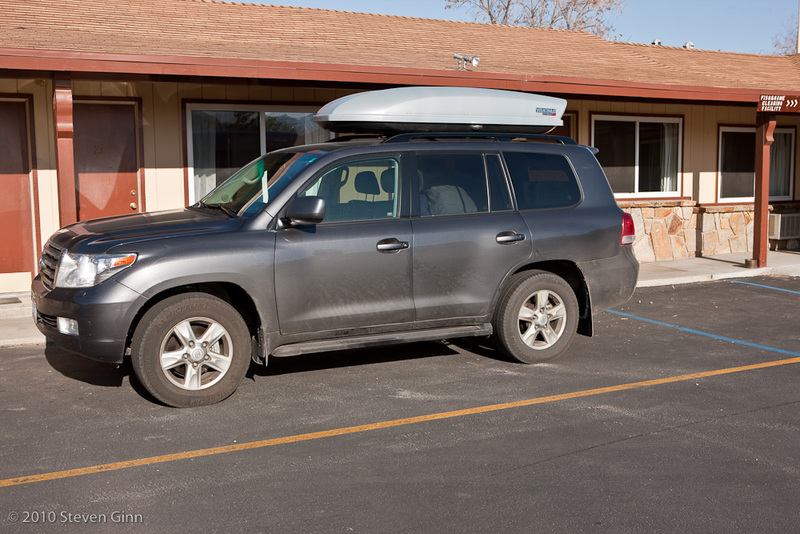 After a brief breakfast of a granola bar and a banana we packed up the car and started on our way to Eureka Dunes. We planned to enter the park from the north via Death Valley Road. 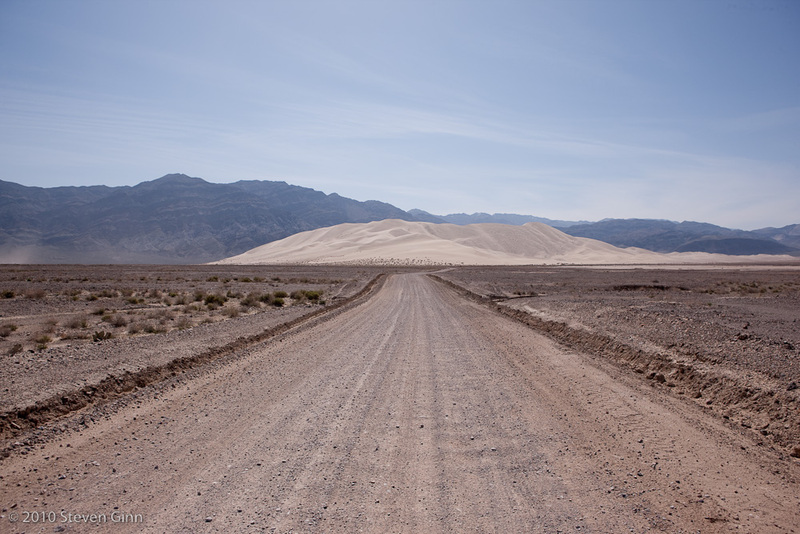 As we discovered yesterday in some scouting we did, the road is paved for the first 25 miles of the 45 miles to Eureka Dunes. 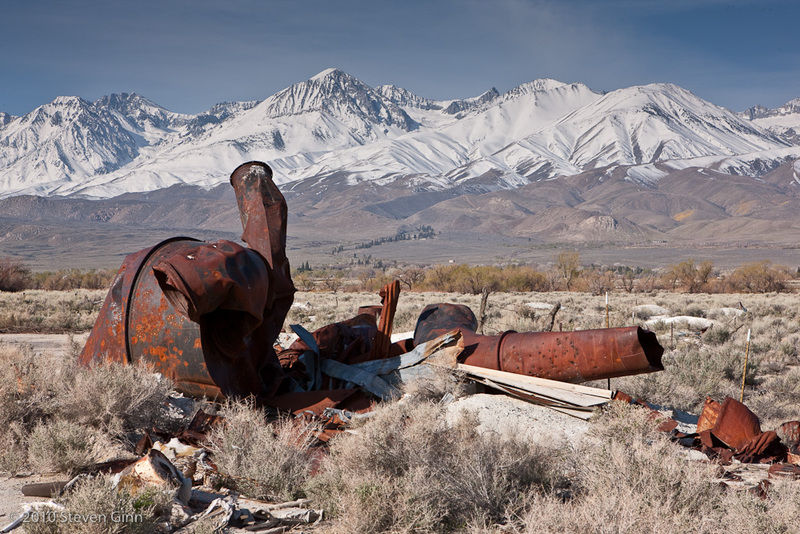 So on our way to the start of the road we took a side trip to take some photos of the Owens Valley which is the name of the valley we were in. 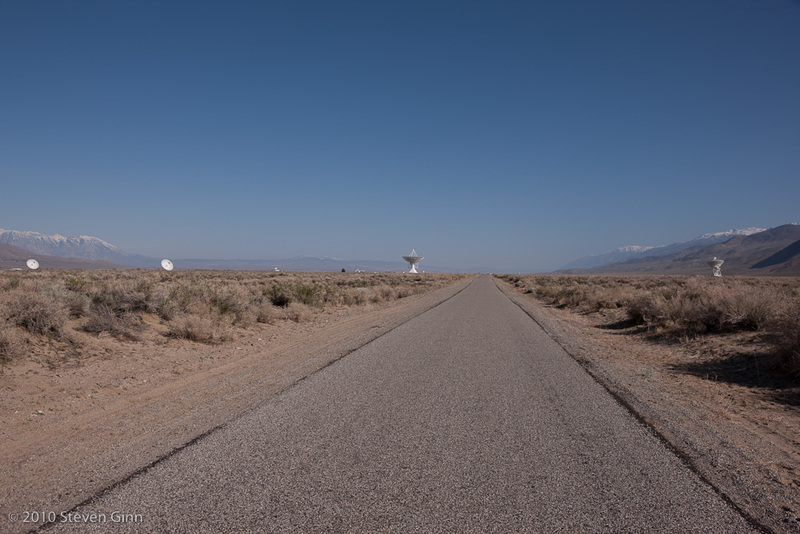 The photo below is looking towards the Eastern Sierras. 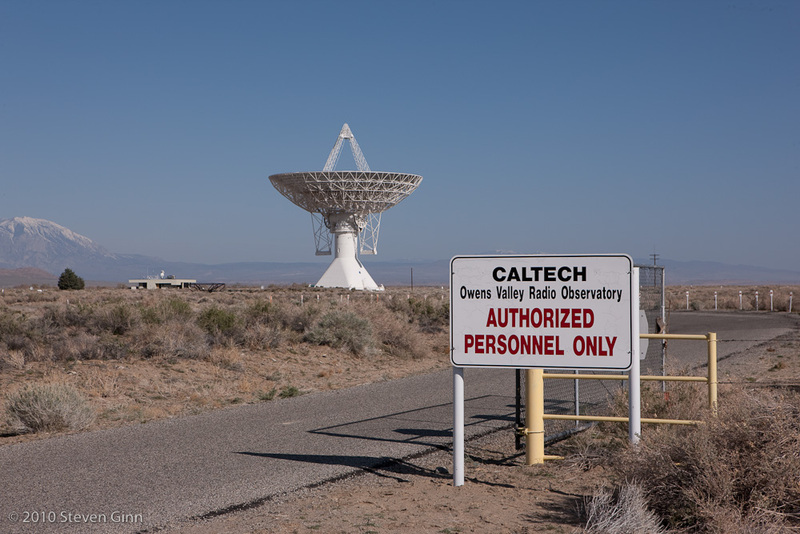 We also found the Cal Tech Owens Valley Radio Observatory site, which is located very near the start of Death Valley Road. Below is a view of all four large dishes along with some hard to see smaller dishes. The drive to Eureka Dunes went smoothly and even faster than expected. 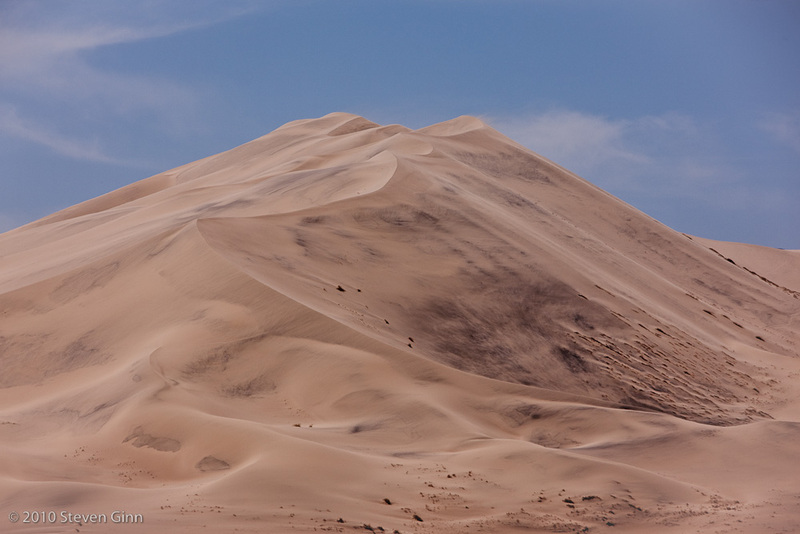 Below is what the dunes looked like as we approached them, I believe they may be the tallest dunes in the US, at something like 650 feet tall. Note the blowing sand on the left side of the image below. As we arrived and looked for a place to camp we discovered that the wind was blowing hard, other folk's tents were being blown down. We found a nice spot and parked the car and got out the chairs and sat on the down wind side of the car and had a beer. After a bit we discovered that we were getting covered very quickly in settling sand. Eventually I took a hike over to the dune and hiked up a short distance and took a few photos. After getting back to the car Rusty and I discussed the fact that the wind was to strong for my car camping tent to stay standing in and the forecast had been for increasing wind. Our plan had been to spend the night and take some sunset and sunrise photos of the dunes. We decided to take what photos we could in the current light and continue on down Death Valley Road to Furnace Creek. Below is the photo I like the best from my images of Eureka Dunes. 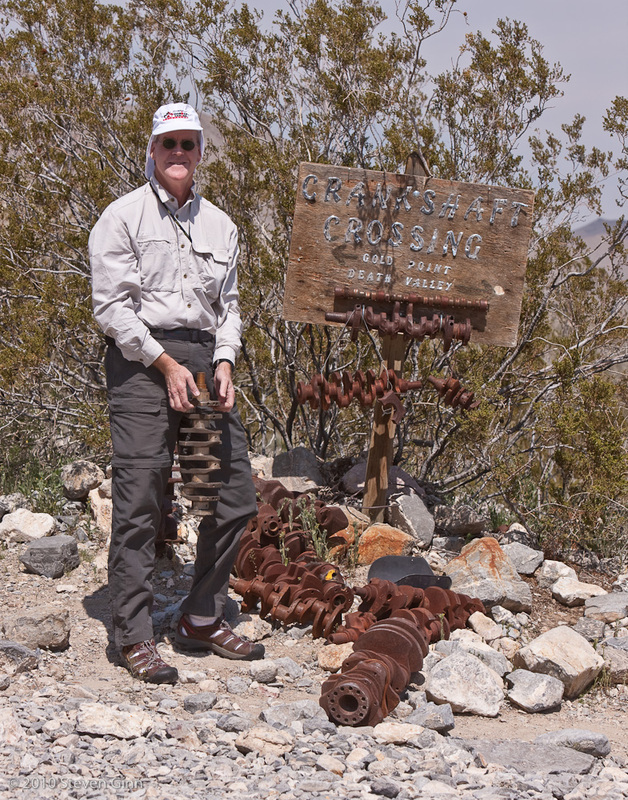 One landmark on the way south on Death Valley Road is Crankshaft Crossing. 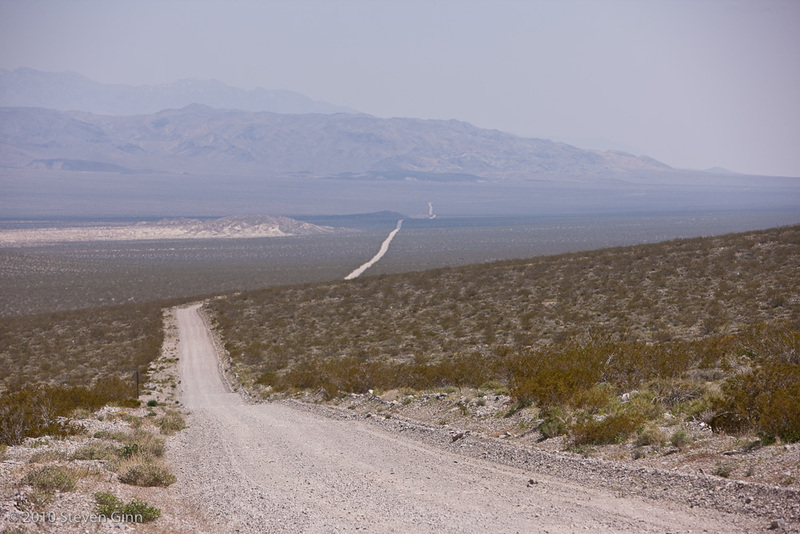 The image below is looking south at Death Valley Road from Crankshaft Crossing. We reached Furnace Creek a little after 5 PM. In preparation for this trip, months ago we made some reservations at Furnace Creek Ranch, and for later in the week at Stovepipe Wells. However, for this night we have planned to camp so now we find ourselves in Furnace Creek a day early, in heavy wind, with the campground here showing full and we need a room. We tried to get a room at Furnace Creek Ranch but of course it was full, especially with campers trying to escape the wind. The only room available was at Furnace Creek Inn. So we took that despite it's very expensive cost. It was a nice room and we had some good drinks and dinner at the Inn.